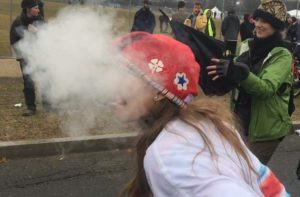 WASHINGTON — The inauguration of Donald Trump drew a number of demonstrators to the nation’s capital on Friday, with some using the event as an opportunity to spread religious messages and some protesting Trump’s presidency and political positions through vandalism and violence. Over 200 arrests were made during the day as some protesters clashed with police, throwing rocks and bricks at officers and smashing the windows of businesses with hammers and baseball bats. A few set garbage cans and newspaper boxes on fire, and one group even lit a nearby limousine ablaze. 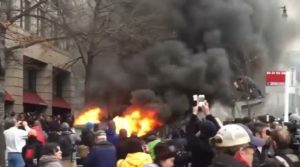 A group of black-clad, masked protesters who identified as anarchists is believed to have caused the most harm, as police said there was “significant damage” to at least four businesses, including a Bank of America facility, a Starbucks cafe and a McDonald’s restaurant. In other chaotic incidents, flash grenades were thrown in the streets, although there are conflicting reports about whether the police threw them to push back protesters or the demonstrators threw them in their angst. Six officers were injured in the violence after being hit by projectiles. Police stated that only a small portion of those who descended on the capital were violent, although many forms of expression took place in the streets. Some held signs declaring “Not my president,” “No Islamophobia,” “Alt Right? More Like Alt-Reich” and “Black Lives Matter,” and one homosexual advocacy group held a banner that read “Out of the closet, into the streets” as they danced to secular music from Abba and Madonna. Religious groups also used the inauguration as an opportunity to spread their message. 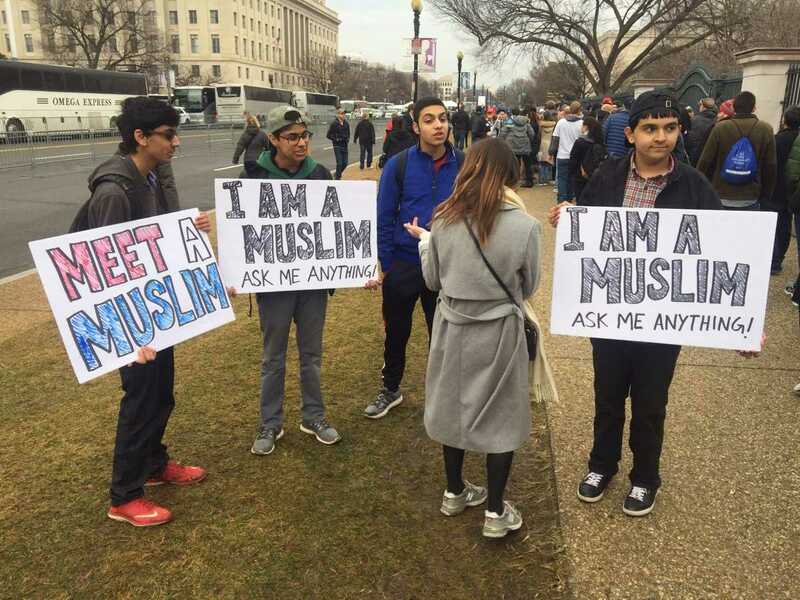 One group, identified as the Ahmadiyya Muslim Community, held signs such as “Meet a Muslim” and “I am a Muslim: Ask me anything,” and distributed pamphlets about the Muslim religion. Some passersby stopped to engage them in discussion or to have their photo taken. A man who rode a bicycle held two megaphones as he made various rhymes and recitations about Jesus Christ and created strange animated noises with his mouth. “What are you looking at? You don’t need your eyes to listen, do you?” he proclaimed. One attendee who approached him suggested to “just read the Bible” to passersby instead. A family of eight—whose patriarch is Michael Woroniecki—carried extra large banners, declaring that modern churches are a “sham,” at various entrances to the National Mall. One of the members of the group stated that he does not know of any Christians outside of his family, while another stated that she can tell who is a true Christian by looking at them since she has the “Holy Spirit.” She would not say whether or not she has ever encountered another Christian outside of her family. According to reports, the U.S. Secret Service, local police and other law enforcement agencies dispatched approximately 28,000 officers to provide safety and order at the inauguration and surrounding area.